Although there is lots to do and see within walking distance, to get the best experience of lanzarote a hire car is recommended. 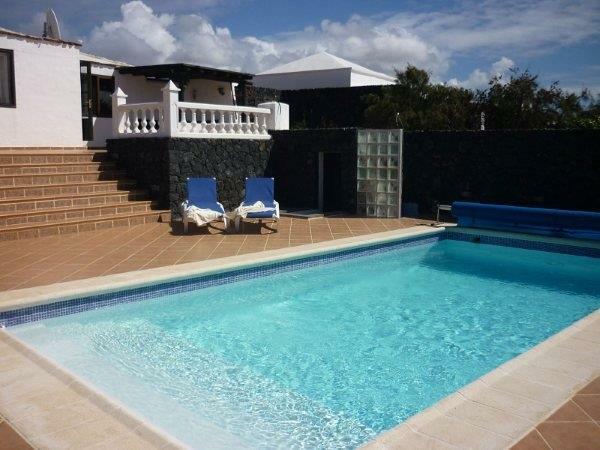 An excellent villa, very comfortable, well located and with a stunning view to the south. Everything that you needed seemed to be there and. although close to essential facilities, it was far away enough to be very peaceful. The climb up the Montana Roja (right next door, so no excuses) was well worth the effort for terrific views of the area. We will also certainly be going back. Stayed at the villa over Christmas and New Year, This villa was recommended to us and we are so glad we chose this one. Inside the villa is lovely and typically Spanish, The outside area was amazing and so spacious with a good sized pool, Great views across to Fuerteventura. As we went for Christmas it was lovely that the villa had Christmas decorations and Christmas bedding, very thoughtful.